Bodacious Biscuit Love: We Made 3 Toy Boxes For Under $20! We Made 3 Toy Boxes For Under $20! One of the things we're doing over at Our Bodacious Dog Mom Life blog site is creating DIY Dog Mom Projects. Like with our homemade biscuit recipes, our mission is to share fun stuff to make that are easy, simple and inexpensive. We wanted to expand on that a bit. There is so much stuff you can make for your pup/s...from beds to toy boxes to toys. As pet parents know, purchasing these items at a store can get expensive. Why not DIY? 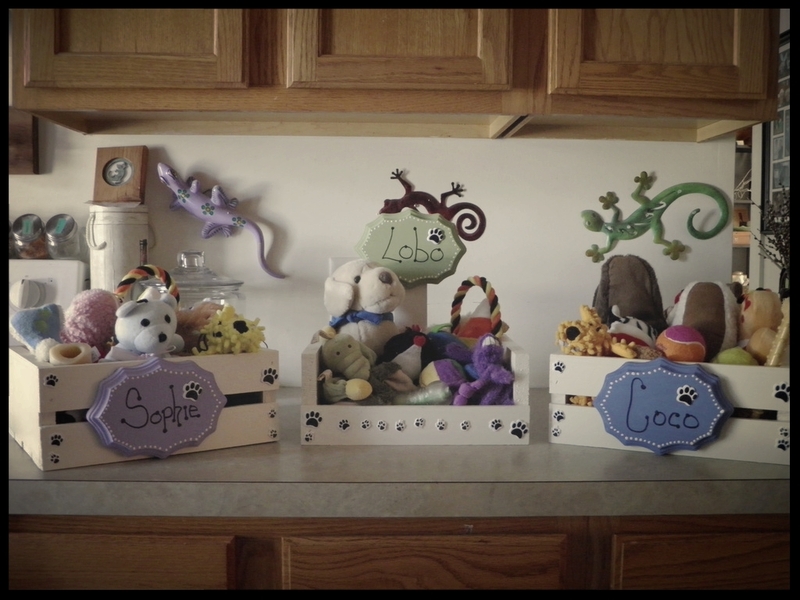 Over the weekend, before baking biscuit love, we made these adorable toy boxes for our fur-kids. Originally, most of the fur-kid toys were kept in a decorative wicker basket. A few years ago, when we only had Coco, that solution worked. Now, with 3 fur-kids, and a ton of toys, not so much. I knew we could very easily make toy boxes for the fur-kids without spending nearly that amount. After doing a little research, gathering coupons and taking inventory of what we already had on hand, we purchased all supplies to make 3 toy boxes for under $20. We were very pleased with the finished product. This is just one of many DIY projects that we'll be making every week and sharing with you on our DIY Dog Mom Projects Page. Be sure to check back often. You may just find something that will inspire you!